Report Bundles is a powerful feature that lets you bundle your monthly reports together with cover pages, budget notes and any other rich text documents which then displays and prints them as one. This help note will introduce the bundle concepts through a sample bundle and show you how to create and manage your own. For details on running individual reports from the standard reports library, including setting the criteria for bundled reports please refer to the help note article – Running Reports. When you click the Reports button in the main ribbon for the first time it will default to the Bundles screen but there is also a standard Reports screen. You can easily switch between the standard reports screen and the bundles screen by selecting the options on the left hand side. 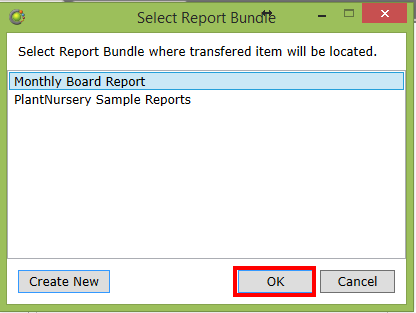 The reports screen contains the full library of available reports including any customised templates, while the bundle screen allows you to group selected reports into bundles and generate the entire bundle of reports together. If you have not already created a bundle, we recommend creating one from our bundle template gallery. This will give you a sample report bundle, which you can use to work through the rest of this help note. For details on creating from a template, please refer to the help note Create and Manage Bundles. If you are new to report bundles I recommend creating the sample bundle as it is the best way to quickly populate a bundle with some content and see how it all fits together. A Report Bundle is essentially a group of Calxa Reports and/or Rich Text Documents. These bundle Items are saved together in a specific order and the whole batch of reports and documents can be produced together as one printable or exportable document. The Report Bundle screen is shown in vertical columns. As you select an item in the left hand column the details about that selection are displayed in the next column to the right. The first column in the bundle screen contains the list of Bundles that you have created. In the screenshot below you can see we have two Report Bundles. The selected Bundle is PlantNursery Sample Reports. When you select a Bundle in the bundle list column, the properties and contents of the bundle are displayed in the second column. In the screenshot below you can see there are 4 items included in the PlantNursery Sample Reports Bundle. If you select a bundle item from the Items list, details of the selected item will now be displayed in a third column. If the item is a Rich Text Document then the saved content and the Rich Text editor will be displayed in the column to the right. In the screenshot below the Cover Page is selected and therefore the saved Rich Text content is in the third column. If the selected bundle item is a Calxa Report, a 'read-only' view of the saved criteria will be displayed in the third column to the right. In the screenshot below the Budget Spreadsheet Profit & Loss report is selected and therefore we can see the saved criteria and the saved Calxa report template for this report in the column to the right. When you select a bundle from the bundle list in the first column all the properties and actions for that particular bundle are displayed in the next column to the right. 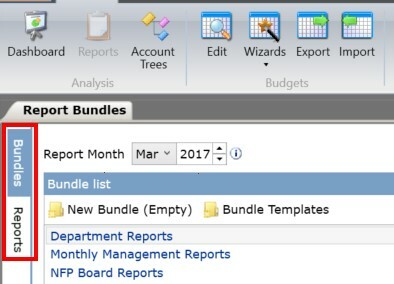 To generate all the reports and documents in a bundle select the Report Month and then click the Display Bundle button at the top of the Report Bundle column. Each enabled Report and document in the bundle will be generated with dates relative to the Report Month. Please refer to the help note Understanding Date Selection for more details on date selection. The generated bundle will be displayed in a new window with each of the reports and documents displayed consecutively. A Document Map on the left hand side shows the reports and documents that are included in the bundle. To navigate to a specific report in the preview window click the report in the Document Map. 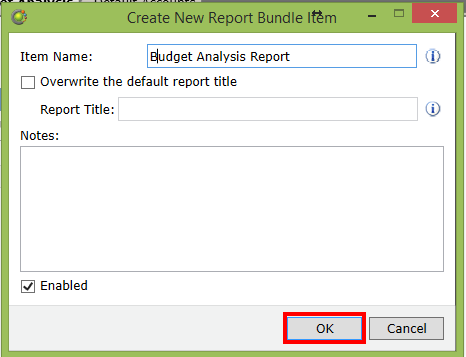 To print the bundle click the Print or Quick Print icon in the report preview toolbar. More details on this toolbar can be found in the help note Running Reports. You can also export the report bundle to numerous different formats including PDF and Excel. For more details on exporting the bundle to different formats please refer to the help note Exporting Reports to Different Formats. Please refer to the help note - Create and Manage Bundles. 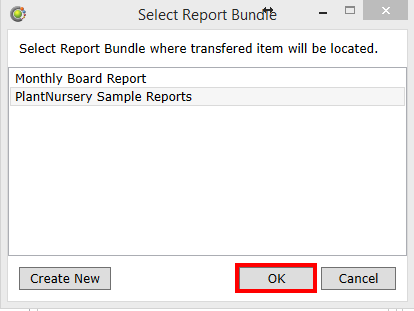 To add a report to a bundle you first need to switch to the Report screen where the full library of report templates including custom templates are available. Adding a report to a bundle is very similar to running a single report. In the report screen you should select the appropriate report, set the criteria and choose a template. For details on these steps please refer to the help notes Running Reports and Understanding Date Selection. Once you have chosen the report and set the criteria click Add to Bundle. 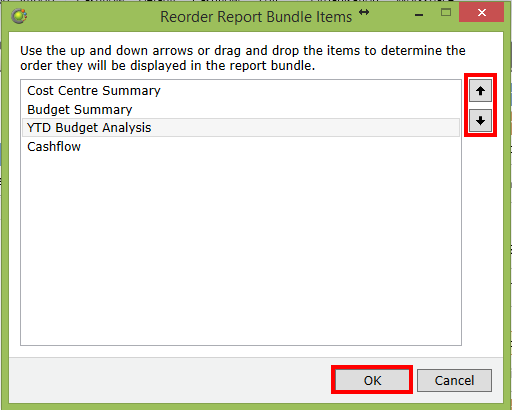 Select the bundle that you want to add the report to and click OK. Complete the required properties for the new Bundle Item and click OK. This is used to identify this specific report in the list of bundle items and therefore must be unique within the same bundle. Each Calxa report template has a default report title. You can optionally tick this option to overwrite the default title with a custom title. 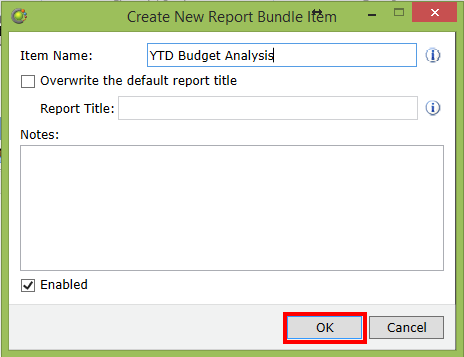 If the option above is selected then this title will replace the default report template title printed in the report bundle. Notes are optional but you may wish to include some notes about this particular report and its criteria. Adding notes here may also help people who use this bundle after you. Bundle items that are not enabled will still be saved but running the bundle will not include this item. 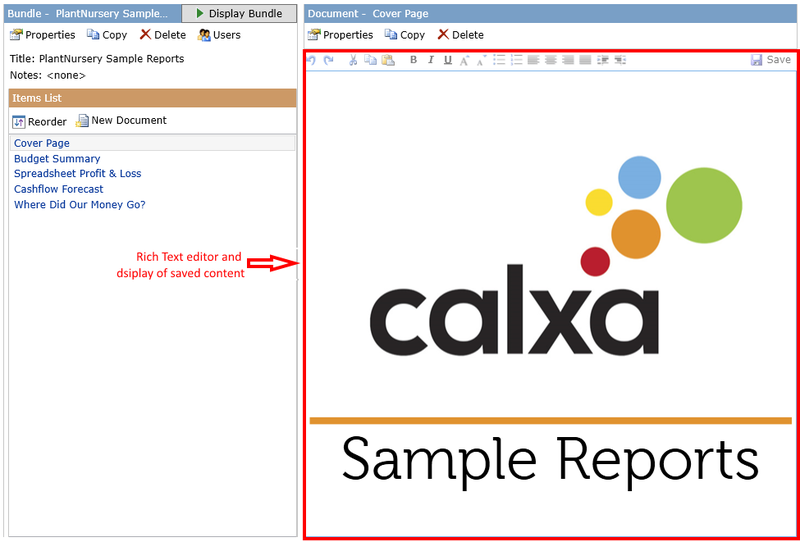 Calxa allows you to insert full Rich Text documents (similar to Word) into your bundles or merge Rich Text content directly into the Header or Footer of a Calxa Report. For more details please refer to the help note Report Bundle: Insert Document or Rich Text Notes. The order displayed in the bundle details column is the order in which they will be displayed or printed in the generated bundle. When you add items to a bundle they are added as the last bundle item. To reorder the bundle items click Reorder. Select a bundle item and use the up and down arrows to change the bundle item's position. When you have finished reordering the items click OK. When you select a bundle item from the item list in the second column all the properties and actions for that particular item are displayed in the next column to the right. 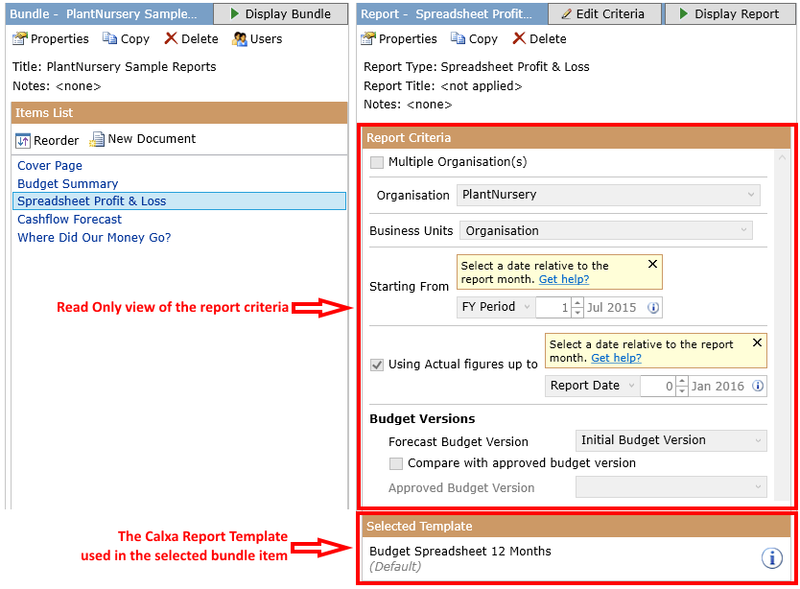 If the item is a Calxa Report click Properties in the item details column. Edit the Properties and click OK. Note: These are the same properties described in the previous section, Add Report or Bundle Item to a Bundle. If the item is a Rich Text Document click Properties in the item details column. Edit the Properties and click OK. Note: These are the same properties described in the previous section Add a Rich Text Document to a Bundle. 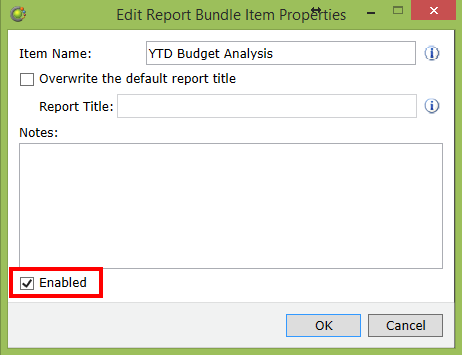 To disable a bundle item from being generated in the bundle uncheck the Enabled option in the bundle Item properties. You can copy a bundle item to the same bundle or to another bundle. Click Copy in the item details column. Select the Bundle you would like to copy the bundle item to and click OK. Complete the required properties for the copied bundle item and click OK. Note: These are the same properties described in the previous sections; Add a Report to a Bundle or Add a Rich Text Document to a Bundle. Click Delete in the item details column. Deleting a bundle item is permanent and cannot be undone. An alternative may be to Disable the Bundle Item. Confirm that you wish to permanently delete the bundle item by clicking Yes. Click the Edit Criteria button to edit the criteria for this report. Please refer to the help notes Running Reports and Understanding Date Selection for details on editing the report criteria.